Robert “Bob” Flood died peacefully at Anne Arundel Medical Center on Friday, January 26th with family at his side. Born on July 9th, 1925 in Frostproof, Florida, he was the son of the late William Hall Flood and the late Annie (Coward) Flood. 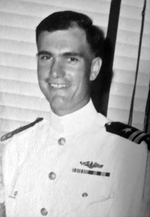 Bob graduated from the US Naval Academy with the Class of 1948 and served a total of 25 years before retiring in 1967. He also received an MA in International Affairs at The George Washington University in 1964. During his 25 years in the Navy, Bob spent the majority of his time on submarines and was Commanding Officer of the USS Becuna from 1960-1962. His years in the Navy were the happiest of his lifetime and took him all over the world. Upon his retirement from the Navy, Bob went to work for Robert A. Green Associates in Tarrytown, NY and from there took a position as Vice-President of Dimeo Construction in Providence, RI. In 1980 Bob and Marilyn semi-retired to Clearwater, FL where Bob worked as a Real Estate Development Consultant until he fully retired in 1990 and they moved back to RI. In 1999 their final move was back to where they lived when they first married - Annapolis, MD. Marilyn passed away in 2000 and Bob was happy to have his Navy classmates and friends to see him through this difficult time. In 2010 Bob found happiness again with his second wife Judy until her unexpected death in December 2017. Bob loved Navy Football, poker, golf, fishing, telling sea stories and traveling. He was also a devoted Catholic who went to daily mass for many years. Bob is predeceased by his sister, Peggy (Flood) Ford, his first wife Marilyn (Green) Flood and his second wife Judith (Duncan) Flood. Bob is survived by three daughters from his first marriage to Marilyn Flood; Elizabeth Flood of Chicago, IL; Mimi Flood Mack and her husband David of Monrovia, MD; and Veronica Flood of Portland Oregon. He is also survived by two granddaughters; Courtney Mack of Austin, TX and Brittany Mack of Monrovia, MD and one great-granddaughter, Olivia Gray. In addition, Bob is survived by his two stepsons and their families from his second marriage to Judith Flood; Jeffrey and Jana Finch of York, PA; Jason and Parin Finch of Columbia, SC; step-grandchildren Cameron Finch, Moira Finch, Sarah Finch and Anjali Finch. A service will be held at the United States Naval Academy Chapel at 2:00 pm on Tuesday, February 6, 2018. Inurnment immediately following the service in the Naval Academy Columbarium. In lieu of flowers, donations can be made to the Naval Academy Foundation (make checks payable to USNAF), USNAF Gift Processing, 291 Wood Road, Annapolis, MD 21402, The Wounded Warrior Project, PO BOX 758516, Topeka, KS 66675 or The Mercy Home For Boys and Girls,1140 W. Jackson Blvd., Chicago, IL 60607. An online guestbook is available by accessing the link on this page.